Charging for computer, mobile phone,MP3,MP4,digital camera etc. 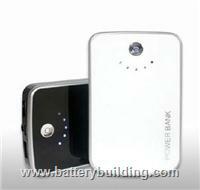 Power supply battery BB-017 using 10400mAh high quality lithium polymer cell. It has an excellent performance such as Ultra-low power Consumption standby,short-circuit protection function,over-current protection function,over-charge protection function,over-discharge protection function,low voltage alarm,high conversion efficiency, etc, with automatically recognized the load function and enter into an power saving mode under No-load condition. This portable power can charge your computer, MP3, MP4, mobile phone,digital camera,GPS,PDA,PSP,IPOD,USP,bluetooth and other digital products.